So things I do like: the sound it great. They are great at noise canceling too it that's what you're into. They look amazing. I love the wood. Both earphones still work great and I've owned these for four months. Buuuuttttt--they will become my back up and that's because despite being only 4 months old, the controls on it whacked out. 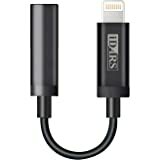 If I even bump the little Sound/skip remote on the headphone wire it zooms up the sound or turns it completely off when plugged into my computer. They are completely unusable with my iPhone. It will constantly bring up Siri or start skipping around in the songs/podcasts, speeding them up, jumping back. I thought it might be a phone problem but when I switched to an older pair non of this was happening. It's made it so I can't work out with them and even worse, I'm a professional Illustrator so I move enough when I draw that I can't use them while I'm with them. So the earphones themselves are great quality. But the attachments are what screwed this product over. 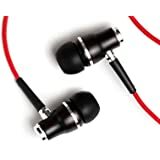 I was really hoping for a pair of earphones that could last over 6 months with the price point these are at, but honestly I won't be buying these again and will try a different route this time. UPDATE 7.20.17: So the company did reach out to me and are sending me a replacement pair. If the new set lasts longer, i will be so happy. I really do like these--just so long as they don't break so quickly. I do wanna make very clear though, the sound on these headphones is really awesome. 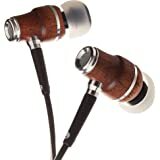 The pair of headphones I have been using since these were broken has much quieter and poorer sound quality (a $15 pair btw), which was immediately noticeable after using these. 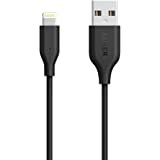 I just wish these ones didn't have the remote at all or possibly had one of those nylon/almost shoelace kind of cords, those seem more durable, lightweight and less noticeable or at least what I use headphones for. I never received any replacement headphones from the company. 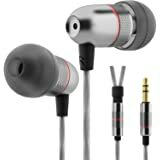 - Excellent 5-star sound quality including bass. - Comfortable 5-star fit in spite of unusual shape. I often leave these in my ears while sleeping, not as comfortable then but surprisingly fine. - Customer support was responsive with about an email every 24 hours for any questions I had. - Volume control not working with my older smartphone (HTC Droid DNA). The buttons change the track instead. They did work on a newer phone (BLU Life X). It would have been better if I were aware of this from product description or elsewhere. - It stopped working properly (sound volume in right earpiece is several times less than the left earpiece). Warranty team did send me a replacement while noting that the replacement's warranty is only for the remaining period of the original warranty, which was just two weeks for me. 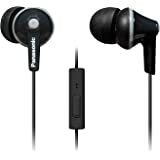 The replacement does not work at all for one earpiece, but with the original warranty period expired, I cannot get a replacement anymore. My best understanding is that they sent me a faulty piece as replacement knowing that I can't do anything. I generally find that most of the reviews on Amazon are accurate, but no so with the Symphonized NRG 3.0. Out of respect for those who shop Amazon, I thought I would post my negative review. 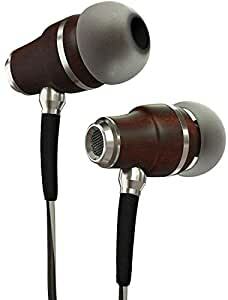 After reading the current reviews, I bought the earphones thinking that advances have been made and that perhaps a wood housing would make a difference. What I found after ensuring that the earphones sealed properly is that the sound was overwhelmed by a muddy base, with a midrange and highs that were neither detailed or balanced. What I found was that the Apple earphones that came with my phone were indeed better balanced and overall a superior earphone. I have also owned Shures, which are superior in every way but are much more expensive. Trust me on this, you get what you pay for and these, at least to me, sounded like a $10 set of earphones with a $10 wood case. I’m returning them immediately. Thank you Amazon.